Friday night - drove up and met my mom and friends at a restaurant for my final girls night in a long time (i'm guessing) while Phillip met up with my brothers for a guys night out. Saturday morning - Met with the photographer at 9:00 to do our maternity pictures. I can't tell you how excited I am about them but another day, another post. Saturday afternoon - Went from the photo shoot, picked up lunch, went to the baby shower. Our Baby Shower turned out to be so much more than we expected. It was so elegant, beautiful and filled with so much love and support. The feeling we had being surrounded by so many friends and family members is something that I can't even put into words. My mom rocked by throwing the baby shower of the decade! We were so touched by the sweet words of everyone there and were overwhelmed by the amount of gifts we recieved - especially for an out of town baby shower. At the end of the shower, after opening our last gift my husband gave a little thank you speech. He told everyone how blessed we are to be able to share this moment in our lives with the same people who were there when we met, were dating, got engaged and of course with the people who shared in our special day - the day we became husband and wife. I didn't even think about that! I'm so glad he brought that out because it is so true. These people have witnessed our biggest moments. They knew me as a young girl, growing teenager, woman in love, the bride walking down the aisle and now, a mother to be. Wow. I get so emotional thinking about that. I'll leave you with some pictures of our baby shower as I go off to finish organizing all of our goodies. A special thanks to Rachel, Luann, Blanca and of course my Mom for making this happen! It was way more than we ever could've imagined. P.S. How awesome do those cupcakes look?! Thanks Rachel! P.S.S. How awesome do those clouds and raindrops look?! Thanks MOM! Aw sounds like you had an amazing weekend! 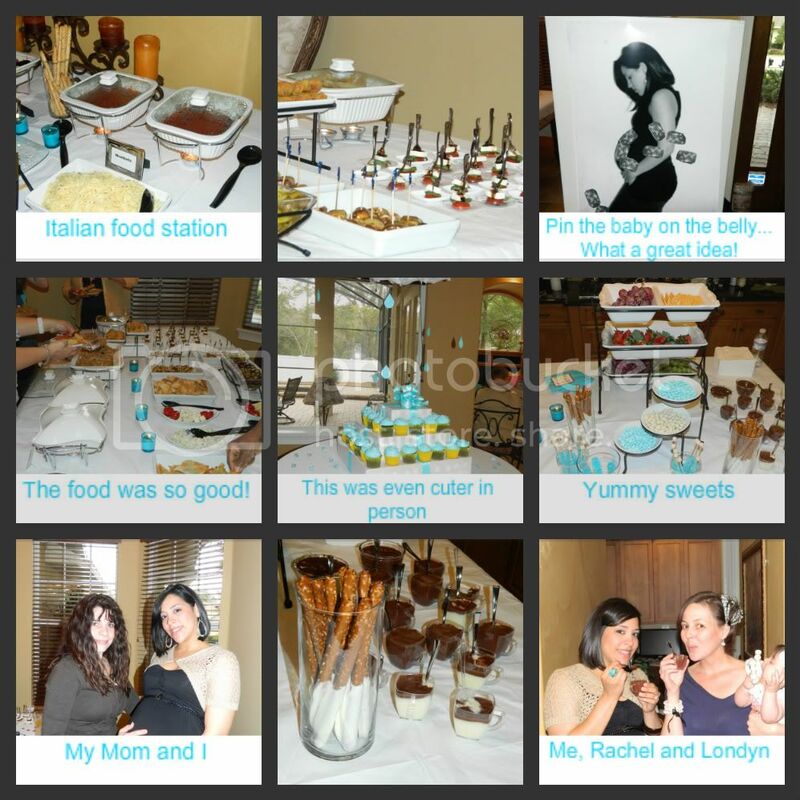 Love the pictures from your baby shower!